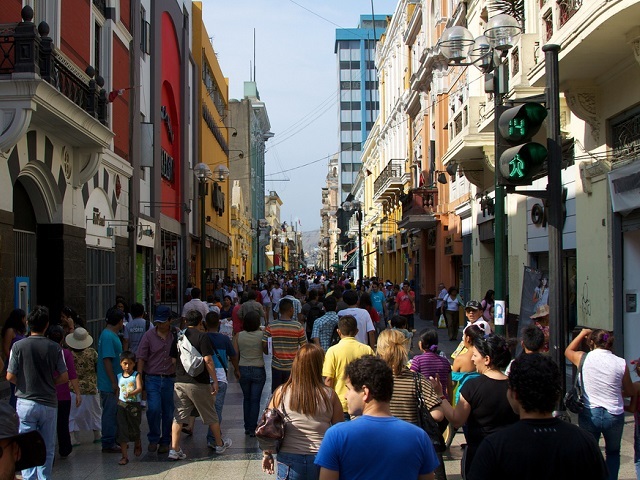 Lima’s human-scale architecture and pedestrian-friendly roads make it a world leader in sustainable development. Recognizing the need to share this knowledge, the United States Embassy in Peru will host the Google Hangout session “Urban Development and Sustainable Transport in Latin America: Lessons Learned.” Photo by Mckay Savage/Flickr. We all have ideas for how to make our cities better places to live. Whether it’s more tree-lined streets, better infrastructure for cycling and walking, or safe access to public transport for all city dwellers regardless of gender, it’s not hard to come up with a long list of characteristics necessary for truly sustainable and livable cities. With over 3.5 billion urban residents worldwide, that’s a lot of potentially game-changing ideas. What’s harder to come by, however, is an outlet for turning these ideas into reality. This Thursday, in honor of World Environment Day, the United States Embassy in Lima, Peru is creating such an outlet. The Embassy will sponsor a Spanish-language Google Hangout on “Urban Development and Sustainable Transport in Latin America: Lessons Learned.” The interactive chat will be led by Robin King, Director of Urban Development and Accessibility for EMBARQ, the producer of the TheCityFix. The hour-long dialogue will explore how sustainable, accessible transport can make cities more livable and confront challenges like climate change, air quality, traffic safety, and public health. Participants are invited to contribute their experiences and ideas for improving quality of life in cities. The Hangout will run from 11am – 12pm Peru time, (12 – 1pm EST). Those interested can connect here, using their Facebook or Twitter account to log in, participate in the dialogue, and ask questions. The Hangout is free and does not require any previous subscription or registration. This is the second annual World Environment Day organized by the United Nations Environment Programme (UNEP), a day dedicated to encouraging “worldwide awareness and action” for the environment. Civil society organizations and government agencies in 100 countries around the world have planned fun and educational activities, from tree planting to beach cleanups. The world’s cities are set to grow substantially over the next two decades, adding over 1.4 billion people by 2030. The majority of this growth will take place within the developing world, with 494 million of these new urban residents in India and China alone. On top of that, cities are expected build more urban area by 2050 than has been built throughout history. The opportunity to put our cities on the path to sustainable growth is now. We at TheCityFix hope that this World Environment Day will help do just that, galvanizing action to make the world’s cities more sustainable and livable and improve quality of life for urbanites worldwide. Log in to the United States Embassy in Lima, Peru’s Google Hangout on Sustainable Cities to contribute your ideas for a sustainable urban future.